Bridge on the Marqual Canal, Cashmere. bl.uk > Online Gallery Home	> Online exhibitions	> Asia, Pacific and Africa Collections	> Bridge on the Marqual Canal, Cashmere. 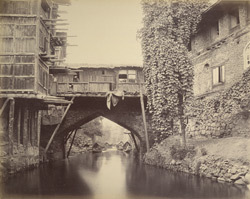 Photograph of a bridge on a canal in Kashmir, taken by Samuel Bourne in the 1860s. In 1864 Samuel Bourne made his ‘Kashmir Trek’, from March to Christmas Eve of that year, starting from Lahore through the Kangra Valley onto the Vale of Kashmir and finally to the Sind Valley. During his travels he enjoyed his visit to Srinagar, from July to September 1864, and spent a pleasant time taking picturesque views, including this stone bridge with wooden dwellings crossing the Marqual Canal. Bourne took a number of images daily while he toured the city, and the Dal Lake and its islands by private boat; he declared that 'Photography here became one of the most delightful occupations'.